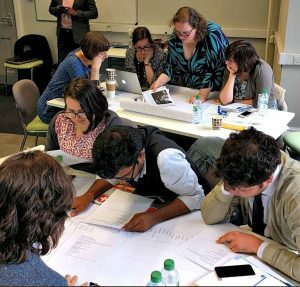 Kat Eleanor Wilson reports on CREATe’s first summer summit, which explored the theme of ‘Open Science and Open Culture’ with a focus on development in the Global South. This post was originally published on IPKat. I was lucky enough to attend CREATe’s inaugural Summer Summit from 26 – 30 June, which was jointly organised with National Law University (NLU) Delhi by Dr Sukhpreet Singh (CREATe, University of Glasgow). The theme of the summit was ‘Open Science, Open Culture & the Global South’, and openness was discussed from every possible interpretation – from open access to open exceptions, from open policy making to open education. This post contains just some edited highlights of an intensive week. The week kicked off with a keynote from Dr Peter Jaszi, (American University Washington) who argued that what is sometimes seen as “gaps” in copyright law are part of its fabric and design. Apart from describing copyright as a luxurious piece of lace, he raised some serious concerns about the constrictiveness of closed-list exceptions against the impetus for openness. It quickly became clear that, while it means different things to different people, “openness” is much more than a buzzword. Openness is, it seems, a very broad church which includes the concept of “free as in beer” and “free as in speech”, and embraces openness to access, remix, re-use, and often more. This concept was developed in the conversations which took place around open education and science. It was clear that openly available education was viewed by Professor Bajpai (NLU Delhi) as a global mandate, and not an optional extra for universities, particularly when state funding is involved. It was interesting to then contrast the E-Pathshala [“Pathshala” is a Sanskrit term for education] with the Massive Open Online Courses offered by the University of Glasgow. On the theme of open science, Dr Arul Scaria (CIPPC) highlighted the risks of fraud and harm when scientific research is not transparent, which is also evinced by the woeful statistics for private scientific journals: 90% of papers are never cited and as many as 50% are only ever read by the authors and editors. In the light of this, the preference of scientific authors for the “impact factor” over open access appears to be ripe for a review. This view was consolidated by Prof Roberto Caso, (University of Trento) who acerbically criticises the scientific community’s apparent obsession with metrics and commodification at the expense of open access and pedagogy. All of this was fleshed out by policy-oriented presentations from Claire Fraser from HEFCE and of Imperial College, both of whom explained in detail the current practicalities and challenges of supporting open access to research outputs and data. Continuing the discussion on open science enabling a more open culture. Dr Thomas Margoni (CREATe, University of Glasgow) queried why the InfoSoc Directive should mandate a “high level of protection”, rather than a “balanced” or “proportionate” one, and whether one-size-fits all copyright protection remains viable. Particular obstacles to academic research across all fields are the limitations of the newish non-commercial text and data mining copyright exception, since it potentially conflicts with the licenses under which academic works are published. To remedy the situation, CREATe’s Dr Giulia Dore demonstrated a new tool supported by Horizon 2020 funding, namely OpenMiNTeD, which is designed to support researchers intending to undertake computational analysis of large volumes of material by text and data mining, and is developing a novel “traffic light” system, which will reveal the compatibility of text and data mining with various forms of licence. This was, of course, made possible by employing text and data mining of license terms themselves(!). This was just one of various new web tools showcased last week, all of which work to further increase openness and indeed are generally available (at least as Creative Commons). There was the Copyright Evidence Wiki, a database for empirical copyright research; Online Media Behavioural Analytics (OMeBA) survey data; and – my personal favourite, and well worth a look – the digitisation of Edwin Morgan’s scrapbooks. This last resource was presented by Jesus Rodiguez Perez and Kerry Patterson, (both CREATe, University of Glasgow) and demonstrates the potentially prohibitive costs and effort required to diligently search for orphan works, notwithstanding the progress made at the EU and UK levels in orphan works licensing and use by institutions, which were thoroughly explained by Margaret Haig from the UKIPO and Victoria Stobo, an archivist at the University of Glasgow. As a practical exercise, we participants attempted our own diligent searches for authors or owners of orphan works registered at the EUIPO and – so it seemed – came close to a breakthrough, but ultimately had to concede. For my part, it took a couple of days to get comfortable with the different conceptions of openness without trying to reconcile them into a homogenous conceptual objective. As Prof Martin Kretschmer has mischievously noted, an optimal framework within one country is to adopt a maximally open IP framework while its international neighbours maintain a closed, narrow approach to exceptions, access and use. Evidently, this is not a universal solution to achieving openness internationally. Two contrasting studies of openness operating in very different contexts. First was on the crowdfunding platform Kickstarter, a platform which seems to reward “remix” culture according to a study by Dr Kristopher Erickson (CREATe, University of Glasgow) . The second considered indigenous cultures, where Dr Saskia Vermeylen (University of Strathclyde) advocates a more respectful approach to shared property, which incorporates fiduciary concepts of stewardship rather than importing closed-off, westernised property principles. To draw together the strands of the summit, the benefits of “open” for stakeholders from Scottish Power to the British Library are emerging. There are practical steps that academics and businesses alike can take already, although the legal framework could be tweaked to nudge openness onto the agenda. What may be harder to shift is the received wisdom, even intuition, that high protection and secrecy necessarily lead to advantages or profits. Another potential pitfall could be conflict resulting from different expectations of a standard of “openness”, although attempting to coin a universal definition would feel somewhat short-sighted and restrictive.